Materials with sports functions are garnering attention for use in various scenarios. Symbolised by athleisure, the trend of overcoming the barrier between fashion and sports is accelerating, and materials with sports functions are taking hold as regular clothing. These materials that support athletes through aspects like a comfortable stretch, heat insulation, high endurance, and waterproofing are being widely adopted in the fashion scene. Japanese materials manufacturers are using their strengths of high functionality synthetic fibres and textile techniques and pouring their efforts into developing functional materials that are also fashionable. Toray Industries, Inc. is seeing favourable sales of its Primeflex material featuring a comfortable stretch. The material uses conjugate fibres characterised by their soft elasticity that is different from elastane. The material is being increasingly adopted for many different kinds of clothing made for active sports to fitness to casual lifestyles. In addition, a new texture has been recently realised through the high-multifilament method for the developed new fibre. Primeflex is a brand with a global strategy started in 2015. It synthesises stretchy materials separated under various names to be a soft stretch material using side-by-side conjugate fibres, and has gained high recognition for not only the sports apparel industry but also for consumers. Preceding this is the polytrimethylene terephthalate (PTT) conjugate. It is expanding the material variation of both woven textiles and knits. For example, for woven textiles, a weft stretch type interwoven with the BODYSHELL EX, with strong UV protection and opacity, is being developed for 2020 spring-summer. Besides woven textiles, there are extensive plans for circular knitting, tricots, etc., and these are being adopted not only for sportswear but also for casual wear such as activewear suits and in the business field. Developed since 2015, the nylon conjugate is receiving increasing inquiries from overseas outdoors brands. The polyester conjugate PTT and nylon 610 fibre both partially contain plant-based materials, and are receiving a tailwind due to the rising interest in sustainability. In addition, the recently developed new fibres include realisation of the world’s thinnest single-thread 0.8 dtex with bimetals. The combination of soft stretch and gentle micro touch is leading to increased adoption for fashion and sports. Teijin Frontier Co., Ltd. developed the processed fibre DELTA SLX that combines random texture of natural materials and the high-quality feel of synthetic fibres with ideal physical properties. Focusing on the year of the Olympics, it is conducting sales promotions in extensive markets including sports for 2020 spring-summer. DELTA SLX combines the special micro-crimp technique for high-balance weave and knit DELTA, and the PTT fibre SOLOTEX coil crimp conjugate technique, to create a newly structured processed fibre with random arrangement of the two fibres with different types of crimping. It has grandrelle and a solid thread with a fineness of 70-150 denier, and has been developed as a textile and jersey that have various uses due to its thickness and multiple variations. For textiles, by developing a design leveraging the fibre characteristics and the dye processing technique, the bulk has been increased over previous materials to create a soft, dense compactness that has a natural feel through random fibre distribution. DELTA’s soft stretch and SOLOTEX kickback feeling are fused, enabling a pleasant stretch. In addition, through the capillary-like form through the different crimped threads, quick-drying properties have been realised double that of before. The trend of sportswear being worn as regular clothing is strengthening in the market, and Teijin Frontier has set its sights on everything from sports and fitness to innerwear, fashion, school clothing, and the uniform market, and is strengthening its sales. 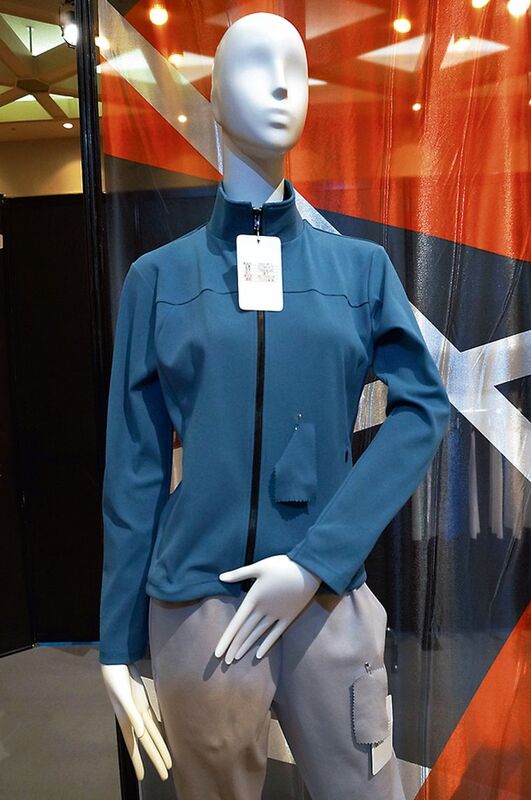 Amaterrace Inc. (Osaka), a company specialising in synthetic fibre textiles, is appealing with the lamination material eVent, a breathable waterproof membrane, from the United States for which it has the sole rights for import and sales since last year. Due to its high functionality and unprecedented freshness of the brand, it is being widely adopted not only for sports but also for fashion brands. eVent is a PTFE membrane brand started in 1999. In contrast with polyurethane that is generally used as a breathable waterproof material, it has high durability and chemical resistance, and in addition to its basic specs of being highly waterproof and high breathability, eVent also is characterised by its ability to avoid mould inside clothing and heat through its porous structure. Although other companies might hide holes when putting together base fabrics, eVent retains this after the lamination process and in addition to breathability also has an effect close to ventilation. 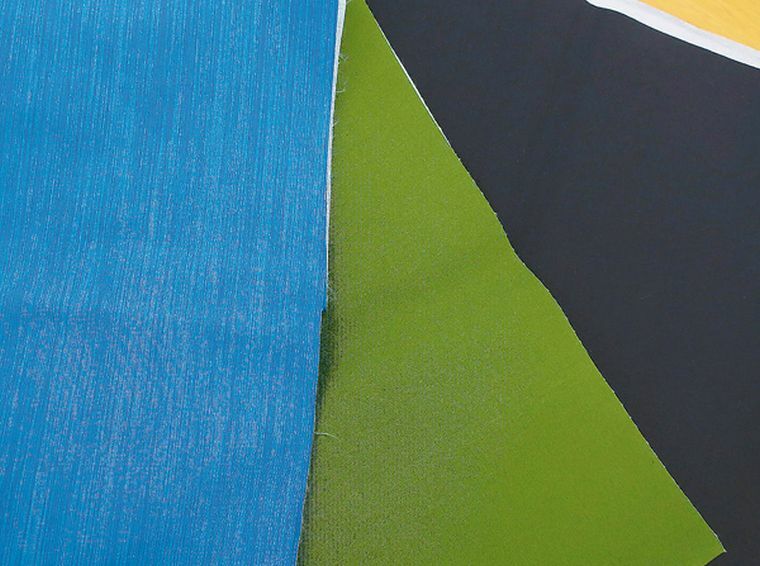 Amaterrace offers different variations of base fabric combinations through its textile development cultivated over many years. It receives many inquiries about its 10 denier nylon lightweight thin cloth and catchy combinations with its powerful nylon CORDURA. It is also developing spun materials such as grandrelle-type nylon, 100% cotton twill, nylon and cotton, polyester, and cotton, and is strengthening its offerings for casual fashion. It is favourably expanding toward 2019 spring-summer, and is being adopted for high-end lines of outdoor brands and specialty stores. There are many cases where it is adopted and is added to the product label, and is garnering attention as a material that also appeals to the end customer. In addition to sports and fashion clothing, it is also targeted for use in bags, uniforms, materials, and more, and is currently under development to be used in work uniforms that can be worn in the rain.